A recent article, “Give.org – The Benchmark for Giving,” reminded me of the importance of BBB accreditation to donors, as well as charities. Reporting since the 1920s, the work of the Better Business Bureau (now the BBB Wise Giving Alliance) is more vital today than ever before, bringing donors confidence in the age of online giving. With the holidays upon us, there’s no better time to remind everyone to look for the BBB seal before you select who you give to this holiday season. It’s easy to feel lost in a sea of online charity ratings, each of them based upon a different premise and often unknown to donors. In the quest to help others, we can forget to ask the right questions, such as whether online charity ratings are truly reliable and based on a charity’s impact track record. 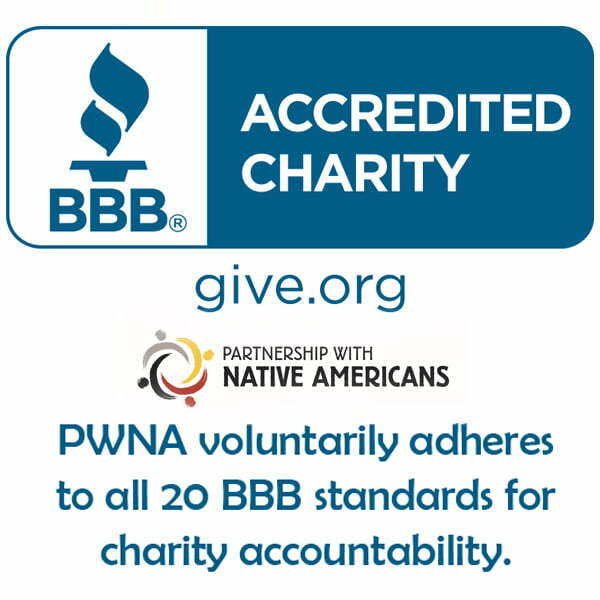 PWNA voluntarily meets the BBB’s 20 Standards of Charity Accountability, increasing donors’ trust in our work. As the “model for effective monitoring and review,” the BBB’s bi-annual process evaluates charities for sound governance, ethics and transparency so donors know the charities that display the BBB seal have been carefully vetted and found accountable. 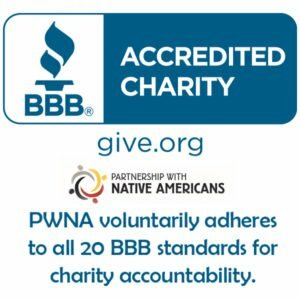 Over the years, donors who’ve supported PWNA and our programs, including the American Indian Education Fund (AIEF), Northern Plains Reservation Aid (NPRA), Southwest Reservation Aid (SWRA) and Reservation Animal Rescue (RAR) and more have proactively asked about our BBB accreditation. I’ve had the good fortune of supporting the BBB’s evaluations of PWNA and have seen how much our organization has learned by voluntarily participating in the accreditation process. In fact, it’s surprising to see that only a few hundred of the 1.1 million public charities in the U.S. make the BBB’s directory of accredited charities, including only five Native American-serving charities. We recently shared our thoughts on how nonprofit programs help fill the humanitarian gaps not being met by government or for-profit industry, so it’s important to support the effective charities. This giving season, I encourage you to seek out charities with a BBB seal and a demonstrated history of impact. You can also check out PWNA’s BBB accreditation report and our latest annual report and impact report. This entry was posted in Humanitarian and tagged BBB, BBB accreditation, BBB seal, Better Business Bureau, Charity evaluation, charity ratings, donor trust, Native American, Standards of Charity Accountability. Bookmark the permalink. Trackbacks are closed, but you can post a comment.